Whilst I’ve written before about the influence of Spin’s Guide to Alternative Music on my development as a consumer/ purchaser/ fan of (relatively) modern music, I’m going to do so again. You see, the one single band it gave me that had the greatest impact was X. As a list man (I know that’s not very cool) I was drawn to the Top Ten albums lists that punctuated the book every so often. 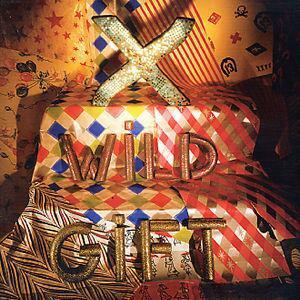 Primarily lists by musicians, many of whom happened to be favourites of mine at the time, I was intrigued at how frequently X’s second album, Wild Gift, cropped up. Frankly, despite following the ‘alternative’ music press for many years, I had never heard of X before acquiring my beloved (and now long lost) tome. So I quickly (and surprisingly easily) availed myself of some X LPs. Funnily enough, although I think all of X’s first four albums are wonderful, wonderful things, I am not at all surprised that they had remained (lurking malevolently) in the shadows during this time. Thinking about it, they have, by and large, stayed there ever since – a distant reminder of a simpler era, their explosively concise brand of punkabilly representing the grand but slightly delapidated mansion at the end of the musical cul-de-sac that began with sturdy foundations from Link Wray, Carl Perkins and Eddie Cochran and then mixed in the dark energy of The Clash at their breeziest with lashings of The Ramones at their punkiest. But, as far as I am aware, X’s discography operates pretty much as its own genre and, hence, their influence on what has come since has been minimal. That, for me, is part of the attraction – there are no pale facsimiles to tarnish their sound, there was no bandwagon to jump on; whatever X tribute acts exist have not yet made it to rural Devon and I have never heard them played on BBC6 Music or any other radio station for that matter. X exploded (musically at least) out of Los Angeles in 1980 with the release of their debut album ‘Los Angeles’, produced three more classic records in the space of the next three years(!) and then slunk away for a while, returning to make a few more albums of, apparently, lesser fare. My infatuation with X stopped at album 4 – More Fun In The New World. All are fantastic but, for me, Wild Gift (brilliantly fitting Nick’s birthday theme I thought) is just that little bit better than the others – the melodies are a bit stronger, the riffs a bit more natural, the palate a little broader. A misleading album on first acquaintance, its energy and brevity providing a sheen of fun that obscures its dark heart – X state they are desperate and, sure enough, familiarity reveals an record of domestic abuse, messy, dysfunctional relationships and urban desolation. With the exception of a couple of throwaway tracks (I’m Coming Over, Beyond and Back), Wild Gift is consistently strong throughout but the first four tracks are on another level and represent the zenith of X’s discography – if you don’t like these songs, I don’t think you’ll like X. Stall setter The Once Over Twice storms into punk anthem We’re Desperate. The pace slows a little for the (almost) white reggae of Adult Books which is followed by the blistering guitar work of Universal Corner which at four and a half minutes is the album’s longest track by some distance. There are other pearls throughout the album and on every track Billy Zoom’s guitar playing is breathtaking whether it’s riffing away in the background or centre stage as it lacerates another song through its heart. As out of step now as they were in their heyday, X’s music stands as proud as it ever did, alone and defiant in its lonely little group of one – the best and (quite possibly) worst punkabilly group the world has ever seen. PS I would be very happy to be corrected if the sweeping and completely unsubstantiated claim made in the paragraph above happens (as is more than likely) to be codswallop. Rob listened: X must top the charts for bands most referenced and least heard. Or some such. I’m saying I used to see them name checked all the time but never heard anyone playing their stuff, or even, so far as I can remember, saw any of their records knocking about, okay? I can hear how Tom might hold them as the best thing ever, and the sounds in general and these songs in particular are appealing and fun. I think that you may have had to be there, however. I’m pretty sure that if i’d come across this record pre-1988 then I would still be clasping it to my busom today. As it is, it’s tough for me to hear it and rate it more than very enjoyable, no matter how much the sound of Talking Heads plating acoustic covers of Dead Kennedys numbers ought to appeal to me. Nick listened: I should have responded to this earlier, because I can barely remember anything about it now, except quite enjoying it, and feeling that it must’ve been pretty directly influential on Dismemberment Plan.